Rx Systems PF: Product Launch Materials - TriFecta Creative. Graphic Design and Creative Services for Your Business. Worked closely with company president in developing and creating marketing materials based around a new product introduction. 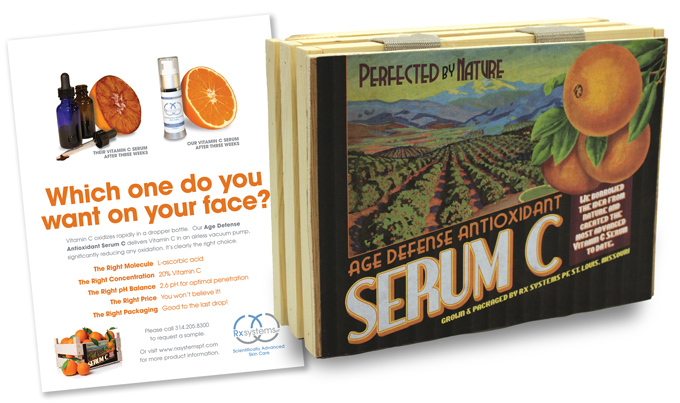 As their product Age Defense Antioxidant Serum C promises advanced delivery of Vitamin C, we conceived of the idea to use a vintage orange crate dimensional mailer. We designed the crate label to resemble a vintage orange crate and worked with the client’s PR firm to deliver this mailer (with new product and oranges enclosed) to key editorial contacts within the industry. Supported the editorial product launch with full page advertising that TriFecta Creative designed, wrote and edited to tie in with the overall theme.